Throughout history, the women who guard Earth's living energy have been known as goddesses, fairies, mermaids, alchemists, but they prefer to call themselves witches. Jade has found her soulmate. Peter is the human whose life-energy is identical to hers, the soulmate who is the missing key to unlock her witch's power. And now Arrow, a powerful organization whose only intent is to kill the soulmates and keep the witches in check, wants their head above all others. After a whirlwind of danger and passion, Jade and Peter managed to evade Arrow in Brazil only to find their assassins have followed them home and, this time, Karyn - the witch who murdered Jade's parents - is personally after them with the lethal ability to drain a witch's energy. Jade and Peter must come to terms with the fact their survival is only secondary to ending Arrow's legacy of murder and fear. Reading book one first is recommended. My review is HERE. The end of book one, Witch's Soulmate. was high energy and amazing. 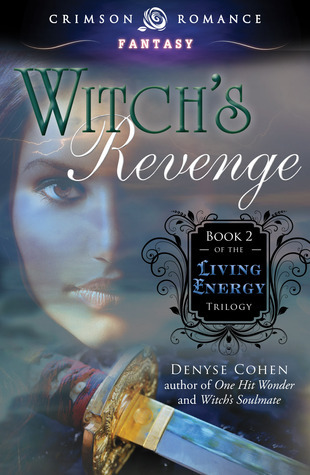 Witch's Revenge picks up shortly after with Peter and Jade trying to find a way to put their lives back together. Part of this includes finding ways to live as normal as possible - for their friends and family to be safe - and also working with the FBI to track Arrow and put a stop to their efforts - both normal and paranormal - once and for all. Karyn, a particular nasty villain, has targeted Jade and Peter as her own. With the deadly ability to drain a witch's power and feed of it, Karyn will be the most dangerous witch they have gone up against - and to top it all off, she's responsible for the death of Jade's parents. The descriptions of Karyn's attacks were phenomenal, and Jade doesn't fare well after their first encounter. Peter and Jade must rally the troops and unlock a secret weapon no one even knows exists yet. But in order to do that, they need to overcome the last of their doubts about each other in order to find it. Unlocking this weapon was a very touching scene of complete devotion and acceptance by both of them. This was a great second book, while it got off to a bit of a slow start, once it got going it really picked up the pace. It took off running and never looked back.